Keiser�s 250 Leg Extension was carefully designed to make entry into the machine easy. It will accommodate a wide spectrum of users from 4� 10� to 6� 8� (1.47 to 2.03 meters). Leg cushions and seat backs are fully adjustable, without getting off the machine. 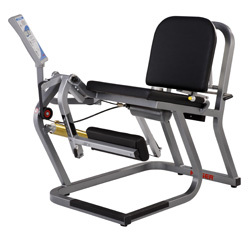 The seat back adjusts forward and back without changing its tilt, protecting the lower back during the exercise. The handgrips house the thumb buttons for convenient control of resistance while exercising. An optional range limiter is available to adjust the starting position from 20� to 120� of knee flexion. The 250 Leg Extension with range of motion offers all the same features as the 250 Leg Extension. The range of motion feature has a simple pull button that adjusts the exercise start position, making it easy for the clinician or the patient to set the desired range. The stop position is independently adjustable and has a soft block at the end of the range of motion.